I’ve been wondering, is there any way to use effectors to apply a random color from a subset of colors (such as a range or gradient)? So here is one method of achieving that. I’ve used the multishader to create a subset of colours. Then the random effector to randomise those colours. Not sure if it is possible from a gradient, but if anyone has an idea for that then please post a comment. Well Rick Barrett from Maxon came up with the solution here. 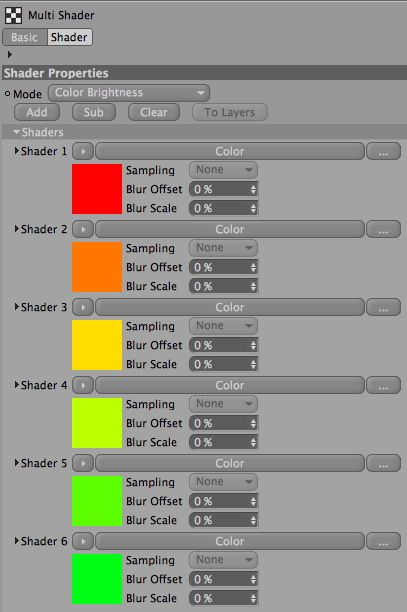 For a gradient, just put the MoGraph Color Shader in a Colorizer shader. Nice and simple too. Thanks Rick. i get a texture error with the multi shader. what’s up with that? If it’s a new scene, with a new material. Then you apply the Multishader to say, the color channel. Do you get a texture error then? I just tried with a fresh scene and it was ok for me. hi, nice blog. Too bad just a little bit topic there. i’m very interested with your logo (hypa tv logo). Is that using GI ? how to create a neon box like that? with diferent color? i tried to use GI and light inside the box but the result is not good enough as yours. Can you explain the making of hypa logo as the next topic in this blog? Sweet…I love pretty much everything I’ve seen. Wish i could make it.. Awesome! Thanks for the simple and powerful solutions, Tim and Rick. Rha ! Thanks God ! Thanks Hypa ! Any idea how to make that work? but it seems impossible ! Can’t I apply this randomness to each letter of a mograph text object ? Same thing for a gradient, I can’t ! @Matt I’d use the shader effector with a tiled gradient. Then offset the position of the gradient in the texture tag. Thanks for the advice, much appreciated. It seems to do the trick, however, I want to feed a series of colors and I want the cubes to only show a fraction of those colors. I have 5 colors : blue, green, yellow, red, orange and only 3 cloned cubes. I want the first cube to start with yellow, the second red, and the third orange and then change to 1-green 2-yellow 3-red, then 1-blue 2-green 3-yellow and so on. 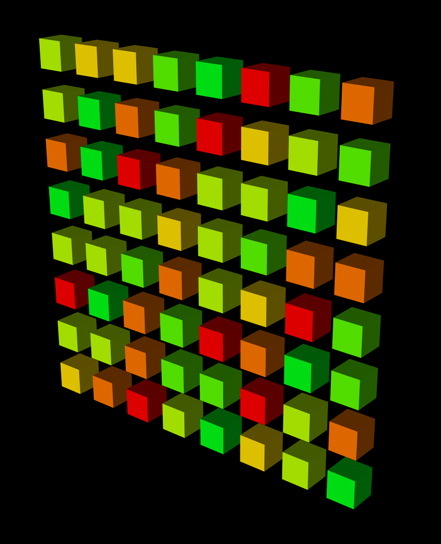 Shader effector with a tile seems to malfunction because it shows all the colors in the gradient and I want to have two-three times as much colors and be able to make them pass through the cubes. Do you know a way this can be done? Thanks, Tim. You are awesome. I just re-read what I have written and it doesn’t make much sense to me as well. Sorry for that. Here is a simplified situation of the same scenario. Hope this better illustrates the goal. I think it could be done with a multishader, random effector with sorted mode and falloff, but I get strange results. If you know a better way, it would appreciated greatly. @Matt Try this file – http://luxx.tv/1i I used a flat projection with a gradient and then offset the texture tag. Use this texture tag in a shader effector. Not sure it is exactly what you’re after but maybe it will help. This was super helpful, Tim. Exactly what I was after. Thanks a ton for taking the time to look into this. You rock!